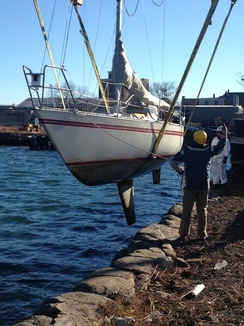 Burton in the crane, Grant with the bow line and Peter at the stern line, Averisera lifted nicely from the harbor to be set up on the hard. 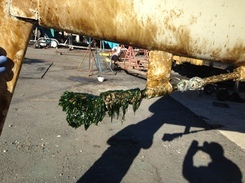 The bottom was scrubbed clean two weeks before haul out. There is no hard growth such as barnacles. Plenty of slime. 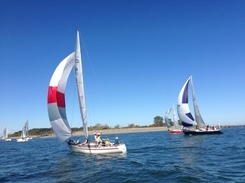 Two weeks ago, we had a last race of the season. 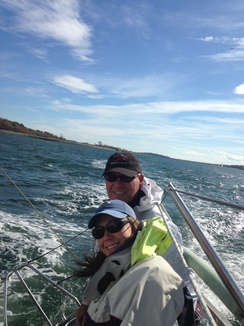 Laura visited us and came out for a windy sail followed by a fun party at Boston Sailing Center. Laura is Norm's daughter and mother of two great little boys, Luke and Marc. 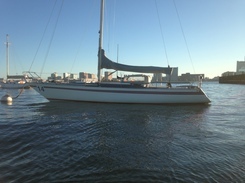 At the end of September, we sailed in the Boston Harbor Islands Regatta and used our new spinnaker for the first time. 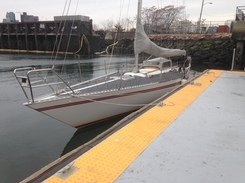 Thanks Doug Pope, sailmaker of Rockland, Maine. 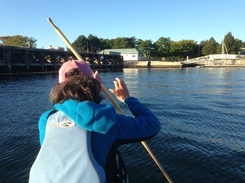 The image was captured by BSC sailor, Allison Mac Rea, who also sailed with Norm some years ago in the Caribbean. Light air in the Narrows. Lovell Island and sloop Eagle in background. 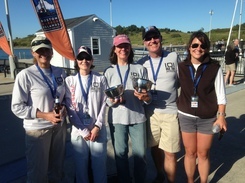 Our crew: Julie, Gladie, Elizabeth, Norm, and Grey. Normally, Tom Brown would have been in the picture buut he was running the PSA's Gosport Race that weekend. The prop never comes out clean. I have tried paint, grease, scrubbing, nothing seems to make much of a difference. Maybe remove propellor? Sail everywhere? At the dock the before hauling. We ran a small heater in the engine space to keep Thumper warm. Temps in the morning were well below freezing. Neither Thumper or Norm are good in cold weather. On our way home from the Maine Rocks Race, we stopped in Kittery and had dinner with Tom and BJ. 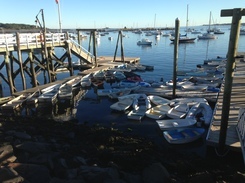 The cluster of dinghies is always amusing.